يضمن فندق Travelodge Hotel Manly Warringah Sydney الذي رمم في 2008 لزائريه قضاء وقت ممتع في هذه المدينة الخلابة سواء جاؤوا في رحلة عمل أو سياحة. يجذب هذا العقار ذو 4 نجوم، والذي يبعد 22 KM فقط عن وسط المدينة و 28 KM عن المطار، الكثير من الزوار سنوياً. سوف يعشق النزلاء موقع هذا الفندق، فهو قريب من أهم المعالم السياحية في المدينة . إن الخدمات الممتازة وحسن الضيافة العالي في Travelodge Hotel Manly Warringah Sydney تجعل إقامتك تجربة لا تنسى. تتضمن الميزات الرئيسية في هذا الفندق: واي فاي مجاني في جميع الغرف, خدمة التنظيف يوميًا, مجهز لذوي الإحتياجات الخاصة, مكتب الاستقبال على مدار الساعة, مرافق مخصصة لذوي الاحتياجات الخاصة. لقد جهزت هذه الإقامة الفندقية بعناية فائقة لتوفر مستوى عالي من الراحة. في بعض الغرف يجد النزيل تلفزيون بشاشة مسطحة, سجاد, قهوة فورية مجانية, شاي مجاني, بياضات. يقدم الفندق مجموعة رائعة من الخدمات كمثل حديقة، لجعل إقامتك تجربة لا تنسى. إن كنت تتطلع إلى إقامة مريحة وهادئة في المدينة، فستجد في Travelodge Hotel Manly Warringah Sydney بيتك الثاني. 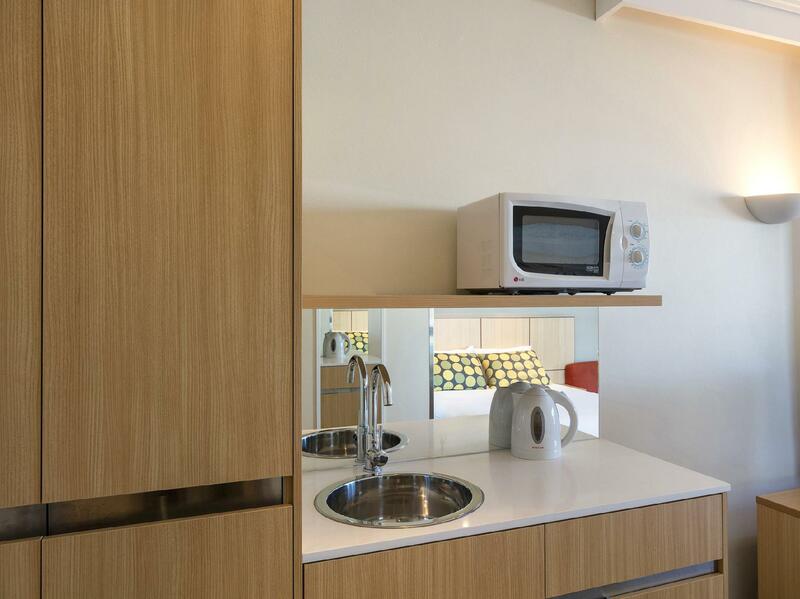 Great rooms and very clean, Only concern is the breakfast as on the first there seemed a great reluctance to cook more breakfast just before closing time and staff were not checking that there was adequate supply. It was a bit better on the second day. 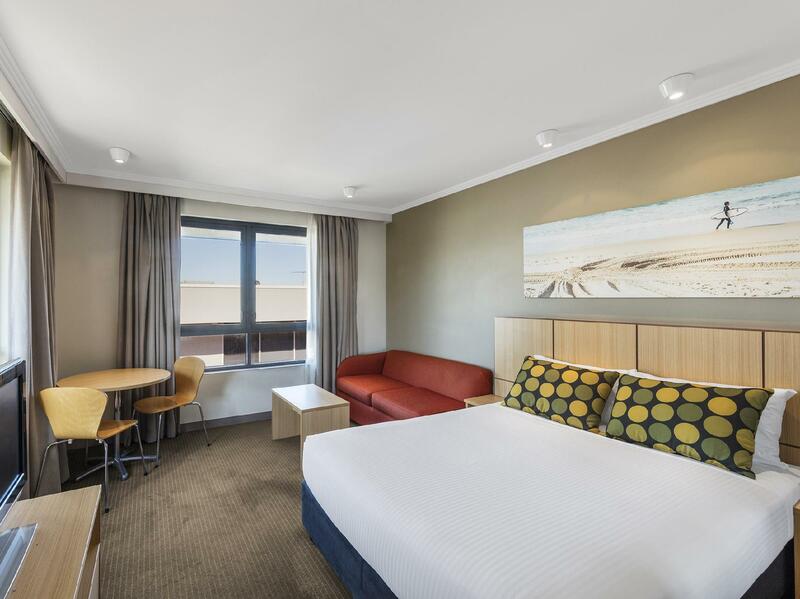 If you're travelling to the Northern Beaches of Sydney, this is a low-cost (relative to other hotels/motels in this region) tidy, reasonably new hotel. We found it quiet and comfortable, and its Brookvale location meant that Manly to Mona Vale were all within 15 minutes by car. Positioned over the road from The Manly Leagues club meant very cheap meals if needed. Westfield's Warringah Mall Shopping Centre is a kilometre away. The room was large and air-conditioned with quite contemporary furnishings. A large double window could be opened (although it was 38C on the day we were there. Most motel facilities were there. Our room contained a shower. Over the road was quite a large Rugby League club where we could eat - or drink at their bar. The room was very quiet even though the hotel was only 50 to 100 metres from a six-lane highway. It is a nice and comfortable place to stay. Hotel is neat and clean. The surrounding area especially the beach area is so beautiful. Convenient location. Near to the beach where varieties of food can b found at the manly beach area. Food is nice and tasty. I personally like the hotel and enjoy my stay there. Highly recommended because it is value for money. Comfortable room. Being Christmas some minor details overlooked, ie. replenish tea and coffee but overall a good experience. We have been staying at this property every Christmas for about 7-8 years as it is close to our family and the odd occasion when travelling to Sydney. Great staff.Rooms basic but clean.The let down is the attrocious breakfasts.Rubber eggs no variety of eggs, crap sausages urgh yukko! Please make the breakfasts nice because its such a let down to the orher great things like the welcoming staff, good price in parking and great location... i know eat the eggs/breakfast and you will soon change it! We have stayed at the Travelodge Warringah at least four times, for usually a month per stay. This last stay, which was not as long as previously at only 16 days, was the best ever. There is really nothing we can fault, except perhaps a carpet which was not as clean as it could be - a very small problem. We arrived in our room to find a hand-written card of welcome, together with a box of chocolates. We felt welcome indeed! The staff at the front desk were unfailingly cheerful, polite and helpful. There are not many motels on Sydney's northern beaches. Manly has a number of hotels but they are much more expensive. This one can be booked on the internet at 20-30% discount over the rack rate of A$140/night. You get a microwave, fridge, electric jug to boil water, iron and hair dryer. You even get bath accessories e.g. conditioner, shampoo, gel. The TV works. I did have problems with the heating because the controls are not obvious and although I pressed Heat On it only lasted 5 minutes then ran on fan only. The first morning I was there was the coldest we had for 5 years so I used the blanket from the closet doubled over and was still cold. Eventually I worked out that if you press Heat On then when it cuts out there is a number 0-9 you can increase by 1 and the heater stays on. What happens if you start from 9 I don't know. My guess is you set this unexplained number to 0 before you turn on the heater. They charge $10/night for parking in a somewhat secure lot. The good news is if you need to leave the car as I did you can pay $10/night versus $60 at the airport although obviously this is subject to available space. They have 120 rooms so there is a BIG secure parking lot. It isn't patrolled but there is a boom gate going in. They also charge $10 for 24 hours internet but if you own a mobile broadband "hot spot" they don't block it and I saw many were in use. Breakfast is $29 which I think is expensive but you have the equivalent of a kitchen and there are restaurants within one kilometre in Dee Why, including Subway. While we were waiting for our son to pick us up the Duty Manager Sunil chatted to my wife and he found we were down for a wedding anniversary. When we got back to our room that evening we found a welcome card, a bunch of orchids and a bottle of wine. This was out of the ordinary and thank you. We arrived at 11.30 in the morning, and the staff could not have been more helpful, looking after our baggage and telling where to park. The staff were very friendly, the rooms were very comfortable, clean and spacious and the location of the hotel. We thoroughly enjoyed our stay. I was a bit hesitantant after reading other people's reviews about the hotel but thought I best make my own mind up. And I'm glad I did as it was wonderful. The young man that served us when we arrived was very pleasant and helpful, the rooms were very modern and had everything we needed. The king size beds were very comfortable and the price we paid for the room was amazing through agoda. The location is perfect and close to shops and other suburbs. Yes we did have to pay $10 a night for parking but we did not mind at all for peace of mind knowing that the car was safe and secure. Friendliness and helpfulness of staff; heaps of parking; and location. Our GPS battery went flat so we needed help getting to Manly Dam. The reception staff googled it for us and printed off the directions for us. I only stayed one night, but was pleased to see enough towel rails to hang towels if we were going for the green option of using the towel more than once.I was also pleased to see a guest laundry. Hi, dont get me wrong, we enjoyed our stay here. The bedroom was clean and comfortable however the grout in the shower needed to be cleaned. Plates and cups and cutlery were not always clean. Buffet breakfast is great. Nice option to dine at the manly clubrooms which is closeby. Prices are reasonable but the convenience was what attracted us to go there. We also liked the fact the lodge was close to Warringah Mall for shopping etc. The TV had a magnetic strip which kept on falling off so i had to keep on putting back on for the remote to work. This was a pain. All in all I would rate our stay at 8/10. Would go back and stay there if we go back to Sydney. See the tick boxes and stop turning this review into a novel. My stay way comfortable and convenient. However, I was disappointed that there was no information in the room regarding nearby places to eat, shop etc. Nor was there any information on how to operate TV etc, necessitating calling reception for help. As there was no evening room service or on-site dining, it would have been helpful to include information on possible home-delivery type meals. I was advised there was the club across the road which offered charge-back facilities but, as a woman travelling on my own, I was not comfortable in going to a football club for dinner alone. Therefore, after checking-in I then had to go out again to find something for dinner that night. My only other comment is that a lounge chair in the room would have been more comfortable than the "at table chair" provided. For those of you who want to stay near the beach, this hotel is not for you. it's located near Warringah Mall which is a shopping centre and it will take about 15 min to walk up there. you'll need a car/public transport to get to either Dee Why or Manly Beach. also, there seems to be some tour coming to this hotel so get prepared for busy morning buffet. The room was clean and seems to be reasonable for the price you pay. have stayed at this venue before as it is convieniently located to go and visit relatives. the hotel really needs more facilities for its tariff rates though and is very basic. no room service, no restaurant, no pool. if you need to use the internet and don't have a smart phone there is a charge. you also have to pay to use the carpark. the staff were really good though and the room was ok too. i enjoyed the buffet breakfast as well though there should be a bit more variety instead of the same things every day.